Hi folks. I've just posted a note on another thread and thought I'd repeat the message here. A friend who was going to take two of my front-row tickets has had to cancel. Contact me if you know of anyone who would like them. $530.98 for a pair. Evelyn - we can use the VHS is you're still willing to loan it to us. Thanks very much for the offer! Are we agreed on O'Connor's Irish Pub in the Centrum then? What time? I may have to slip away early -- or arrive a bit late -- to pick up Brenda and deliver the tix to those who are getting them from me. BTW, someone may be interested in buying just one of my tickets. I've been reluctant to break apart the pair, but if anyone knows of someone looking for one (or two!) tix in the front section, let me know. Looks like my friend joe and I will be able to make it to ottawa, so will try to make it to meet up. Look forward to seeing you both, Vern. Sorry I missed you in Madison. How about 5:30 at O'Connor's? I'm not sure when we can pick up the will call tickets so this will give us time if we need to do so right before the concert. Paula - I checked with a friend of mine whose wife is disabled. They go to O'Connor's a lot and he says that it is accessible. I have a complicated schedule. I'll be at O'Connor's between 6:30 and 730. See you there! My sister Cathy and I will try to be there for around 5:30, looking forward to seeing you. 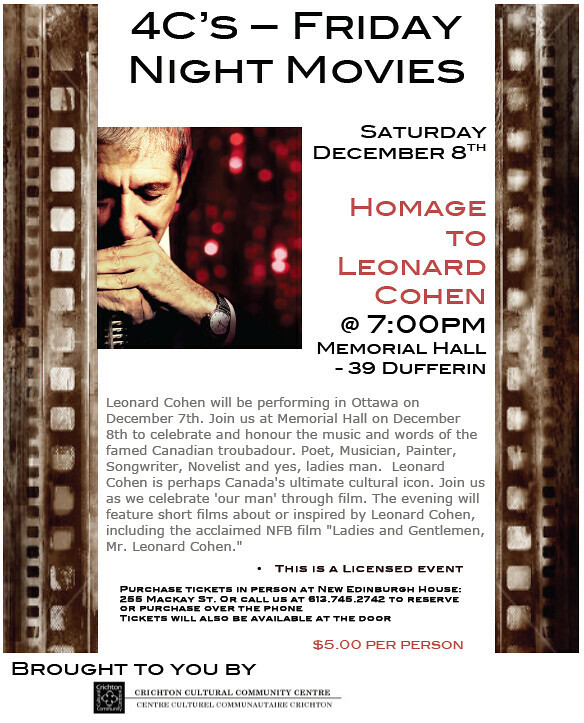 Here is more information on our "Homage to Leonard Cohen" film night, scheduled for Saturday night 7-10. Is anyone interested in a post-concert meet in Bert's Bar (located on the 100 level of Scotiabank Place). We did this last week at the Patti Smith / Neil Young concert and it worked well. Having a beverage in a warm bar sure beats the traffic jams in a cold car. Sorry, can not make the pre-concert meet due to a work related meeting. That's a great idea, Klyde. I was hoping we'd all get together after the show as well, and Bert's Bar makes sense. I've made a reservation at O'Connor's for 5:30. I estimated 10 people but if more people show up that isn't a problem. For those who aren't familar with the pub it is opposite the movie theatre. The reservation is in my name (Mary not Mollydog!). Klyde - please count me (and possibly my son) in for the post concert meet up. Paula - do you think it is necessary to buy tickets in advance for the movie night? I will be going with a friend. Thanks for the news about picking up tickets early Mary, I will definitely go early. Normally I would say there is no need to reserve tickets, but I will check in the morning how many have been pre-sold. We have a capacity of 200 and normally have anywhere from 30 to 70 people at our movie nights, BUT apparently the CBC's Alan Neil will be mentioning the event on All in a Day tomorrow afternoon, so you never know. Oh the other hand many people have Christmas parties Saturday night. Just to be safe I will reserve a few tickets for our group in the morning. Looking forward to seeing everyone tomorrow night. Thanks for making the reservations, Mary. Ten people may not be enough -- I have two people meeting me there between 6:30 and 7:30 to pick up tickets, and I may or may not have five people with me. That's a possible eight people just for my gang alone! Sorry that I can't nail numbers down with any greater certainty.